Just over 71 years ago, on 6th June 1944, the Allies launched what remains the largest amphibious operation in history – the invasion of Normandy. On Gold, Sword, Juno and Utah beaches Allied casualties were relatively light. But on Omaha, operations went badly wrong. 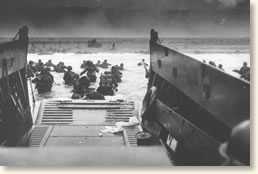 Of the first wave landing on the beach more than half were killed or wounded within minutes – many did not even make the beach. On all sectors, the attacking troops assumed that heavy naval and air bombardments would have destroyed the German defenses, and created craters for cover on teh beaches. However, these early bombardments had missed their targets – leaving the men to attack heavily fortified positions without any real cover. On most beaches, the allies could rely on amphibious DD tanks, launched with the first waves, to provide cover and supporting fire. On Omaha beach, however, the troops were also lacking this armoured support. The bad weather meant that the Channel was being rocked by 4 to 6 foot swells – the DD tanks could only float in calm water. On other sectors, local commanders adapted and launched their tanks very close to shore. At Omaha, the plan to launch the tanks 6000 yards from the beaches was followed exactly – with disastrous consequences. Almost all the tanks were swamped and sunk by the heavy seas. The lack of tanks meant that the troops on Omaha had nowhere to hide, and had no heavy weapons to break through German defenses. This was one of the factors that lead to their heavy losses. later in the day, as troops began to adapt to the conditions, the landing on Omaha beach was finally achieved. What do D-Day and large-scale data integration and migration project have in common? Assumptions can lead to disaster. Data profiling and discovery technologies expose unknown data risks and issues to the analysts, quickly and cost effectively. Working with an accurate understanding of the data is critical to effective data migrations and data quality initiatives. June 9, 2015 in Data Quality.